Building Information Modeling or BIM has been around the architectural profession for several decades, but it is just now hitting the offices and projects in the construction industry as new delivery and contracting methods are arriving on the scene. Those new delivery methods and the emergence of virtual reality and augmented technologies pioneered by NASA and the gaming industry, are fast becoming the next wave of technology hitting the construction industry scene. There are quiet conversations among the “Techies” in the industry about 3D, 4D, 5D and even 6D or 6th dimension BIM. Most of the research and development is currently in the 3D environment and is exemplified by the introduction of Augmented Reality Technology by Google and Autodesk. 2D – Regular drawings that we have used for decades. 3D – Systems and drawings supplemented by BIM and VR. 4D – The addition of time to the 3d system that allows the timing and sequencing of labor and materials for construction by the trades. 5D – The addition of costing to the process. 6D – The addition of life cycle costs that will allow the owner-users to determine the overall costs of the various systems that are being proposed for their projects. It should be noted that the life cycle costs are over 60% of the total long-term costs for any project. Designers and contractors in the industrial sector are utilizing several of those technologies. Some commercial contractors are investing, but not many specialty contractors are doing any research on BIM and A/R yet. ENR, Construction Dive and Echelon VR have posted the names of some of the large contractors and design firms who have “BIM Caves” where the development work is carried on, the results shown to potential owners and used for training of the crews who will have the responsibility for its implementation in the field on the jobsite. 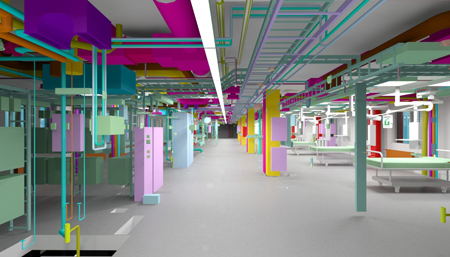 There are a few Specialty Contractors who are using BIM and investigating other technologies. Marek, a Houston based drywall and interior finishes firm with operations in Houston, Dallas-Ft. Worth, Austin, Atlanta, and San Antonio is one of them. I recently sat down with two Marek BIM-VR specialists Paul Godwin, BIM manager, and Hector Gonzalez, BIM Specialist, to catch up on their current activities in this area. Marek is currently investing R&D dollars in AR/VR as an enhancement to their well-developed BIM capabilities. I wanted to get an idea of how they are using these technologies currently in their business, to understand how this specialty contractor will use the R&D results and to get an idea of what they see coming on the horizon for the industry. You seem to be on the leading edge of this technology in your specialty. Why is Marek investing in it? Answer: We, as a firm, believe that the industry must do a better job of training both our office and field personnel in their craft. As we see how difficult it is to attract and retain skilled craft workers into a career in our industry, we are looking for ways to clearly define what training is needed to meet rising industry standards and how we might use the new technologies to implement that training. How long have you been providing this type of training? Answer: Like many of our peers in the industry we have been doing the basic OSHA safety and on the job training for years, but in 2006 when the market plummeted, we realized that only the most highly trained and skilled specialty contractors would survive long term. We began a training process that has evolved into a formal program to provide our workforce with the training they need to be safe on the job site and to enable them to meet the demands of the evolving technology of the buildings we build. What is the purpose of this R&D? Answer: We understand that the pace of technological change in the industry is accelerating and that the facilities we build, the teams we serve, and the craft skills that we need demand that we stay ahead of those technologies if we want Marek to survive for the long run. Answer: The ultimate goal is to train our workforce and keep them trained so that they can take these technologies into the field and better enable us to compete for and to build ever more complex buildings more productively with a higher quality result. For the owner that means faster construction times with fewer redos leading to lower life cycle operating costs. How are you currently using it in-house? Answer: All of our project estimators use BIM to identify potential cost savings and ensure constructability of the project by our team. We are doing R&D on emerging technologies such as VR and AR to enhance that capability in the field. Answer: All of our field supervisors have tablets and that has already paid off in fewer on-site problems, improved safety for our workforce and smoother scheduling of our finish construction. We use the technology for real time video, face time between the jobsite and the project managers and logistics for materials and work teams. Working with the other disciplines like MEP? Answer: Much of our work, especially in complex environments like healthcare facilities, requires early and continuous coordination between the trades. Since we build the interior finishes, we have to fully coordinate with other specialty trades like MEP so that we can finish those interiors in a way that avoids conflicts between walls and systems and also provides access for servicing of those systems over the life of the buildings. This makes the technology one of our most important tools. What is the biggest challenge you have doing this research in addition to your day-to-day jobs? Answer: As you can imagine, the R&D takes time to understand, develop, refine, test, adjust, implement and get feedback. Since these new technologies are just now being adopted in the commercial construction industry, products emerge every day. The newer products can be quite expensive, especially now as the augmented reality is being incorporated into personal equipment. So we would say that time and funding are the two biggest challenges that we have. What do you see as the biggest challenge of moving the technology into the industry? Answer: The construction industry, in large part, is notoriously slow to adopt change and that applies to this technology. The biggest problem today is the wide variety of platforms that are being used to communicate designs, specifications between owner’s reps, estimators, contractors, and the craft teams making the projects a reality. This has been a problem for the last 4 decades, but we see a convergence of those technologies that will enable faster adoption of these new technologies in the industry. You currently use “Total Station” for layout on the jobsite? Answer: We use Total Station to do our layout for walls on the jobsite. It is very accurate and helps us minimize human errors that lead to redos and change orders on the jobsite. Do you see new wearables that will utilize AR on the jobsite? Answer: There is no question that wearables from RFIDs to identify and track craft workers, tools and materials on the site to augmented wearables like safety goggles and hard hats that incorporate these technologies will become commonplace in the next 5 years. What do you see happening on the jobsite in 3-5 years with this technology? Answer: There is what has been called the biggest “shift change” ever going on in the industry. The “Boomers” are fast retiring and the “Millennials” are taking over the industry. The Millennials have grown up using technologies that did not exist a decade ago. They are comfortable with those technologies and they will not only use the technology, they will demand that companies adopt new technologies as rapidly as possible as long as they meet the safety standards that construction in tomorrow’s environment will allow. We see more use of the technologies that we are researching here at Marek. We see a wider use of robotics to meet the craft worker shortages that have become a reality today. Marek understands that we need to continue and expand our technology and training in order to maintain the high standards demanded by the owners and designers who are using new materials and technologies in new ways. After our discussion with the folks at Marek, I would say that BIM is in fact here to stay and that virtual reality, augmented technology and mixed reality technologies are fast approaching the construction jobsite. If you are using these technologies, we would like to hear your stories.